Corsair is a very well known brand that makes quality computer peripherals and accessories. I recently got hold of Corsair's Katar gaming mouse and started using it with my primary PC. Here is my full review of this gaming mouse after having used it for more than a month. If you want to check some of WePC's round up of the best gaming mouse to see other great options like Corsair's Katar Gaming Mouse. It is composed of different quality gaming mice, perfect for different types of gamers. My previous wireless mouse died one fine day, and it was time for me to buy a mouse that was better suited for my current needs. I now occasionally played DOTA games for which I needed a mouse that had better precision and gave me the option of changing dpi settings on the fly whenever I needed to. After a bit of research, I settled for Corsair's Katar gaming mouse. The Katar mouse at first glance looks small and elegant. The size and the clean shape makes it look very pleasing to the eye. Once you lay your hands onto it and feel the grip you realize that you've made the right choice. Both the sides of the mouse are rubberized and have triangular shapes for that perfect grip. Other parts of the body are made up of good quality plastic with a matte finish all over. This mouse has an ultra lightweight of 85 grams and has a 1000 Hz polling rate. It is powered by a non-braided USB 2.0 cable that gives an incredible 1ms lag-free response rate. The cable length is roughly 6 feet which is the standard these days. There are a total of 4 programmable buttons including the mouse wheel that can be programmed using Corsair's software available on their website. The most important and the most distinct feature of this mouse is the massive 8000 dpi sensitivity. Although dpi is not a measure of a mouses' superiority over others, however, this feature works in your favour in some games. The default dpi is set to 6000, but you can always increase it to the maximum using the default software. It should also work great for users with ultra large displays. 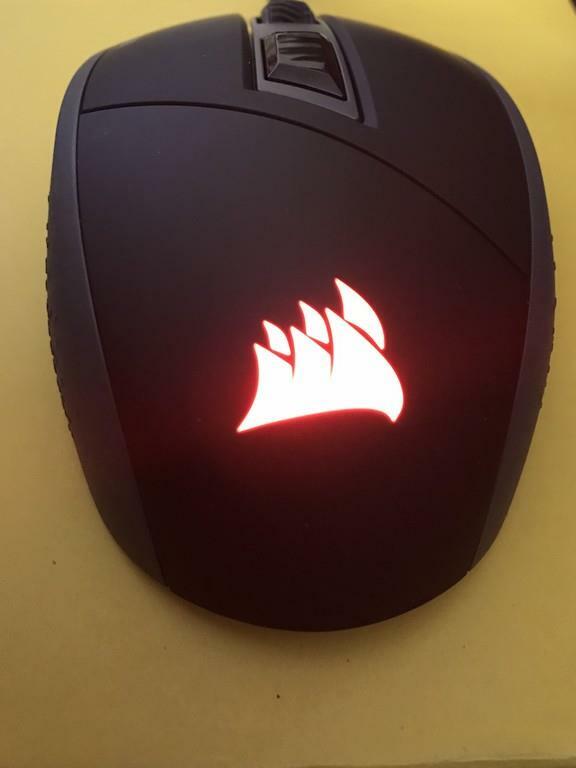 The top portion of the Katar gaming mouse has Corsair branding and a red LED enabled Corsair logo that is customizable to be either always on, off or breathe. The breathing effect of mouse LEDs is something that I've always liked. There aren't any ventilation vents that are visible on the mouse to keep it cool. But then again, I've never seen a mouse that's gotten hot during extended use. The mouse clicks are super smooth and tactile. They make a 'clickety' sound that I personally do not like. I know a lot of people who may like their keyboards and mice to make those clickety sounds when pressed, but I like my devices to be super silent. At the bottom of the mouse, you would find three super slippery glide pads shaped in a smiley that help the mouse skim over any surface you put it on. I've personally used the mouse on tables, sofas, beds and every other possible place and it has always performed brilliantly and accurately. There is also an optical sensor in the middle that can be adjusted up to 8000 dpi as mentioned earlier. This mouse is completely plug and play and works on almost all formats of Windows and Mac. However, to make it even more customizable, Corsair has released a software on their website that'll let you customise it to your standards. This software also lets you create profiles and save them. This way, with a click of a button, you can change the entire settings of all the buttons at once and revert to default with another. One of the best features of this mouse is its quick response rate and 8000 dpi (dots per inch) optical sensor. DPI is a measure of how sensitive the mouse is to even the minutest of movement. This mouse gives you a flexible range of 400 - 8000 dpi. Pressing the dpi button on the mouse each time changes its sensitivity from 400-800-2000-4000-6000 (default). In layman's terms, the mouse pointer would be the slowest at 400 and the fastest at 8000. This mouse is perfectly suited to left-handers and right-handers. Since there are no additional side buttons, both left and right-handers can use this mouse to their maximum advantage. Since I have large hands, I've been used to the 'palm grip' on all my previous mice that were equally large in size. This mouse, on the other hand, is pretty small and forces me to get used to the 'claw grip' instead. Some people who prefer the 'claw grip' may see this as a positive point. The clickety sounds of the buttons. This may also be seen as a positive feature by some users. This mouse is a bit of a dust magnet. Over a period of time, you would see a bit of dust collected on it. Also, if you have oily hands, you may see a lot of fingerprints on it. After having used this mouse for over a month and after considering all its pros and cons, I would definitely recommend you to buy and try this mouse for your gaming needs. This is a highly accurate, no lag mouse that easily fits the palm of your hand. I bought this mouse while I was holidaying in London for a great deal of 33 GBP. You can buy it at a similar price from Corsair approved offline stores or from your nearest computer store. This mouse is also available on Amazon India. I hope this article was useful to you, please feel free to comment below if you have any questions on this mouse and I will try my best to answer them as soon as possible. Thank you for sharing this great post. In this post give good information for katar gaming mouse review in detail that helps people.